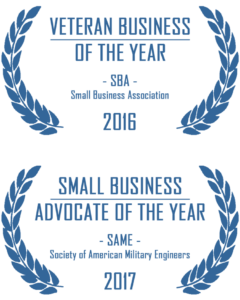 RSM Federal is an award-winning coaching and consulting firm that works with small, mid-tier, and large companies to accelerate their understanding of the government market and learn how to position for and successfully win government contracts - with exceptional results. 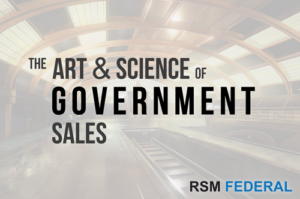 Providing the Art and Science of Government Sales TM, RSM Federal has quickly become a nationally trusted educator, trainer, coach, and consultant to other companies, associations, and coalitions. We emphasize basic and advanced strategies, tailored specifically for your company to accelerate success and revenue. We leverage a proven combination of industry expertise and measurable strategies to deliver cost-effective and high-value results for our clients. With nationally recognized expertise and hundreds of resources, techniques, templates, and step-by-step strategies, your company can immediately accelerate your marketing, prospecting, sales, teaming, and proposal activities - literally overnight. 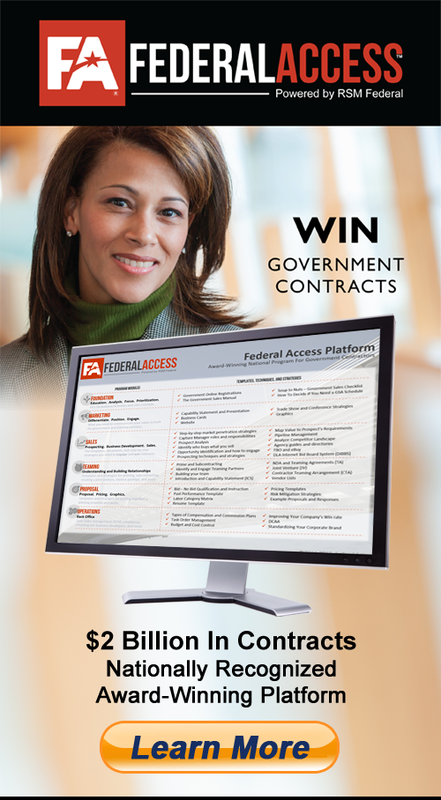 Don’t take our word for it, our clients and Federal Access members have won billions of dollars in government contracts. These are the tools and resources you need to accelerate into the federal space. For most companies, successfully selling to the government is much more than registering, having a GSA Schedule, identifying opportunities in FedBizOpps, or small business certifications such as minority, woman, or veteran owned. Why do companies succeed? They succeed because they understand the federal market and more importantly, the techniques and strategies required to win new contracts. This is the Art and Science of Government Sales TM. The average company takes three to five years to successfully sell to the government. Our clients do it in six to twelve months. Don't take our word for it. The proof is that our clients win contracts. We do not just advise. We help you do it. you know exactly what you need, let's talk.